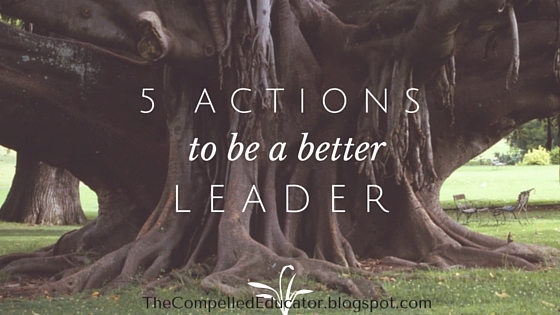 Whether you’re an aspiring leader or a veteran leader, this is a list of 5 actions to start doing today. Already doing all 5? What would you add to the list? Leave it in the comments. 1. Believe in your own abilities to help, support, and lead others. Great leadership starts with growth-oriented mindset, and a belief in one’s self to impact and influence a team or individual. 2. Model risk-taking and recovery from failure. If innovative ideas are honored and new ideas are tried, there will be some failure involved. Let others see how you recover and respond to setbacks and use them to move forward. Failing forward turns a road block into a speed bump. 3. Assume the best in others. Not assuming the best in others leads to mistrust and broken relationships. Love for others undergirds these powerful assumptions. 4. Highlight and celebrate others. Others feel validated and respected, which leads to greater morale and opportunities for stronger relationships. Lighting another person’s candle doesn’t diminish your own. 5. Put yourself in your team’s shoes. Empathy is like a muscle that can be exercised and strengthened. By seeing things from your team’s point of view shows that everyone has value and is an important part of the team.